I am excited to note that last week Gov. Doug Ducey signed into law a measure that represents a major leap forward for Pima Community College and for the economic development of our state. Through newly enacted Senate Bill 1322, community colleges will be able to help Arizona’s workforce rise to the top of a brutally competitive 21st-century global marketplace. It removes some caps on spending money necessary to develop career and technical education programs in high-demand fields such as cybersecurity, nursing and aviation technology, and in the science, technology, engineering and mathematics (STEM) sectors. It also provides relief for community colleges engaging in entrepreneurial activities, such as entering into contracts with employers to provide workforce training. The law does not raise taxes. In fact, it protects the interests of taxpayers by establishing a clear, transparent method for estimating full-time student enrollment used to calculate the College’s expenditure limitation. The law provides PCC with the financial predictability necessary for effective strategic planning. SB 1322 passed with bipartisan majorities in both the House and Senate. The Arizona Legislature and Gov. Ducey deserve praise for recognizing the legislation’s benefits to workforce and career readiness. PCC joined with the state’s nine other community college districts in championing the legislation, but the effort would not have been successful without the backing of the area’s education, government, business and community leaders. Thank you for your ongoing support! I am particularly proud of the way the College community stepped up, especially Executive Vice Chancellor for Finance and Administration Dr. David Bea and Executive Assistant Carl Englander; Executive Director of Media, Government and Community Relations Libby Howell and Advanced Analyst Michael Peel; and contract lobbyist Jonathan Paton. As Governing Board Chair Mark Hanna remarked last week in a message to the College community, “This success will translate into a stronger Pima Community College that develops and trains students to become future workers and leaders and in turn strengthen our community and its economy. You should be proud of your accomplishment and we appreciate your efforts.” Well said. This entry was posted in Uncategorized and tagged Arizona Legislature, career and technical education, CTE, economic development, Gov. Doug Ducey, jobs, workforce development on March 30, 2016 by pimachancellor. Something very nice happened at last night’s Governing Board meeting. An important member of the business community came forward to publicly praise PCC. Ed Stolmaker, the president and CEO of the Marana Chamber of Commerce, expressed his support for “the vision and mission” of the College because of the role we play in training our region’s workforce. Well put, Ed. Thank you. This entry was posted in Uncategorized and tagged Chamber of Commerce, economic development, jobs, Marana, training, workforce on July 10, 2014 by pimachancellor. 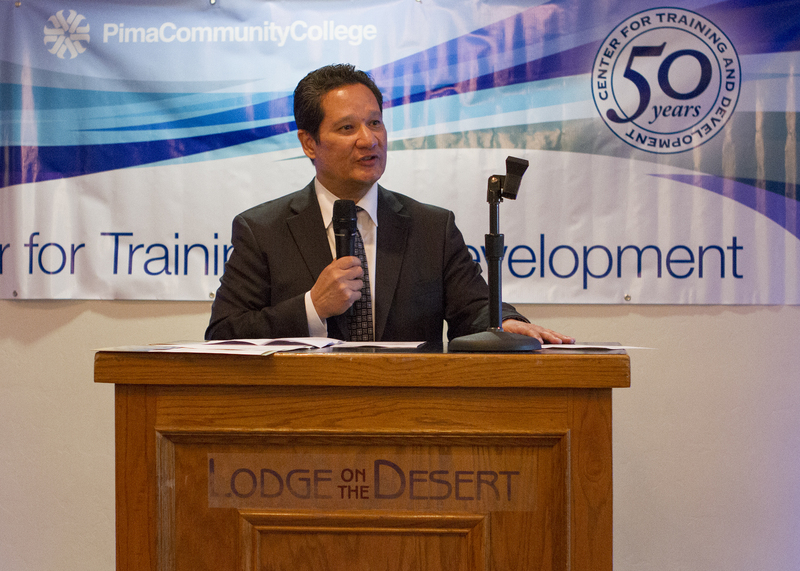 The celebration of our Center for Training and Development’s 50th birthday is an appropriate time to acknowledge CTD’s accomplishments and focus on the ever-increasing challenge Pima Community College and Tucson will face regarding the area’s No. 1 priority: jobs. Last night I had the pleasure of attending CTD’s 50th anniversary reception gala, which marked the establishment of an endowment fund to support current and future CTD students with scholarships and other funds, as well as providing professional development and program support. Since its founding as the Tucson Skills Center in 1963, CTD has touched the lives of nearly 50,000 people, providing high-quality training leading to immediate jobs or to job advancement in the health, culinary and food service and business professions. It boasts a 90 percent completion rate and an 85 percent job placement rate. CTD completers average an hourly increase in wages of $4 to $6. One example of CTD’s impact is the Pathways to Healthcare program. The College and its great partner, Pima County OneStop, are working together to administer the initiative, which is funded by a five-year, $18.5 million federal grant targeting the area’s poor. So far, nearly 400 individuals have completed training, most in CTD programs, in fields that range from home health aides and medical billers to paramedics and nursing assistants. For businesses, CTD provides a pipeline of talent. For those folks who complete the program, it is a steppingstone into meaningful work. It is life-changing. Our collaboration with OneStop demonstrates the importance of partnerships between educators, businesses, government and community groups. CTD has numerous connections to hospitals and other healthcare providers, the culinary industry and community organizations. The need to work across sectors, leverage resources and be responsive to current and emerging challenges is more acute than ever. That is because the needs of our region are profound. Data tell the story. As I have written before, Tucson has the dubious distinction of being the sixth-poorest city in the U.S. The Pima County unemployment rate is 7.2 percent, and the numbers of people employed or actively looking for work are declining, The Pima County average weekly wage of $795 a week is far lower than in Maricopa County ($905) or the U.S. average ($903). Fewer than three-quarters of Pima County’s high school students graduate. Arizona ranks 43rd in creating private-sector jobs. And jobs, as Gallup CEO Jim Clifton says, are becoming “the new currency” for leaders, whether at the national or local level. We all need to do better training, attracting and holding onto workers capable of filling the jobs of the 21st century. Maintains industry-recognized, third-party-validated and -certified state-of-the-art programs. Henry Ford said, “Coming together is a beginning; keeping together is progress; working together is success.” I will see to it that PCC does its part to be a leader and a catalyst for change as our community works together to build a solid foundation of economic growth. This entry was posted in Uncategorized and tagged CTD, economic development, employment, jobs, Pima Community College, training on September 5, 2013 by pimachancellor. As a finalist for chancellor of PCC this spring, I read extensively about Tucson to learn more about the community the College serves. Among the data I came across, one statistic stood out. Tucson is the sixth-poorest metropolitan area in the U.S., according to the U.S. Census Bureau, with 1 in 5 Tucsonans living below the poverty line in 2011. In the aggregate, poverty correlates to high unemployment, anemic economic growth, poor academic achievement and low-paying jobs. Individually, it invariably amounts to the dispiriting sense that the American Dream is receding ever further from reach. The statistic is, of course, sobering. But it is heartening that in the six weeks I have been Chancellor, I’ve talked to a wide variety of people – decision-makers in business, education, government, as well as leaders of civic and faith-based organizations, and students and others just trying to make ends meet – and not one has lost hope. No one accepts that decline is our destiny. As a first step in fighting back, one must comprehensively identify a problem, and I want to congratulate Tucson’s daily newspaper, the Arizona Daily Star, for shining a light on the issue. The Star this week is publishing an in-depth series on poverty in Tucson — its causes, human impact and solutions. And I am pleased that the Star, in chronicling one of many solutions to this multifaceted problem, has spotlighted the effectiveness of the Pathways to Healthcare program, a partnership between PCC and the county’s OneStop Career Center, in breaking the cycle of poverty. Pathways to Healthcare is funded through an $18.5 million U.S. Department of Health and Human Services grant offering financial assistance for low-income people to train in high-demand health professions. 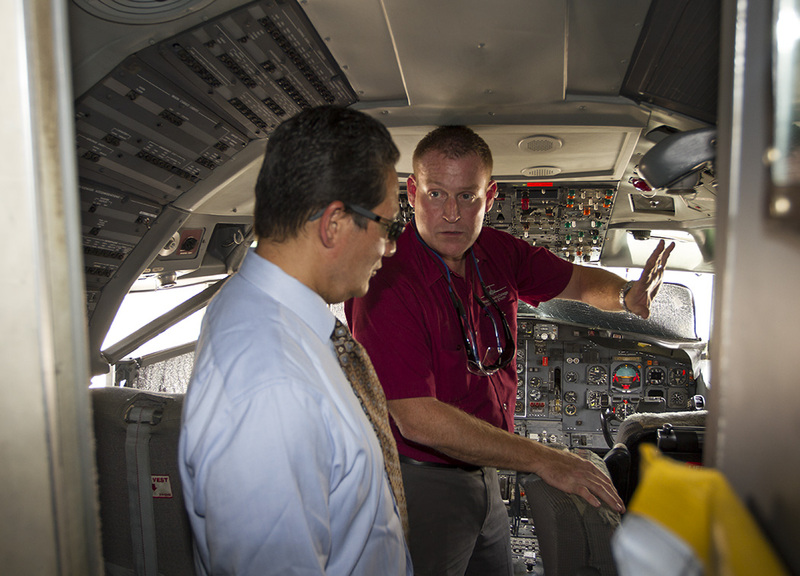 Most of the training is offered through PCC’s Center for Training and Development. As of August 1, 950 students had signed up for Pathways assistance. Pathways’ goal is to enroll a total of 1,750 to 2,000 students over the five-year life of the grant. As of August 1, 378 of the 950 Pathways participants had completed training in fields that range from home health aides and medical billers to paramedics and nursing assistants. A total of 310 Pathways participants have gotten jobs. Now for the real bottom line: The average entry-level hourly wage for participants employed in the healthcare sector is $12.05. Compare that to Arizona’s minimum hourly wage of $7.80. Pathways to Healthcare is but one attempt by PCC to improve the future economy of our community through meaningful employment. I will write about others in the days to come. It is appropriate that a public conversation is taking shape now on this critical issue. Fifty years ago this month, hundreds of thousands of Americans converged on Washington, D.C., to hear Dr. Martin Luther King Jr. deliver his landmark “I Have a Dream” speech. Dr. King knew that gaining political rights without economic opportunity was a half-victory. In fact, the event was called the “March on Washington for Jobs and Freedom.” In 1963, the link between the two was clear. It remains so today. This entry was posted in Uncategorized and tagged economic development, jobs, Pathways to Healthcare, Pima Community College, poverty, training, workforce on August 7, 2013 by pimachancellor.